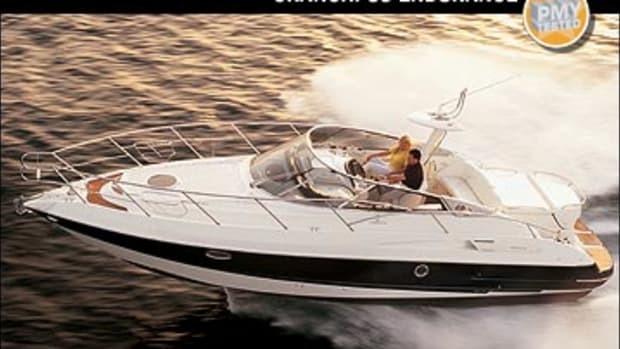 I surmise that my prior Formula experience is one shared by many performance-oriented boating enthusiasts: running 50-plus mph while leaning hard against a flipped-up bolster at the helm of a sleek, low-profile, high-speed cruiser in a driving, skin-stinging rain. Oh, that didn&apos;t happen to you? 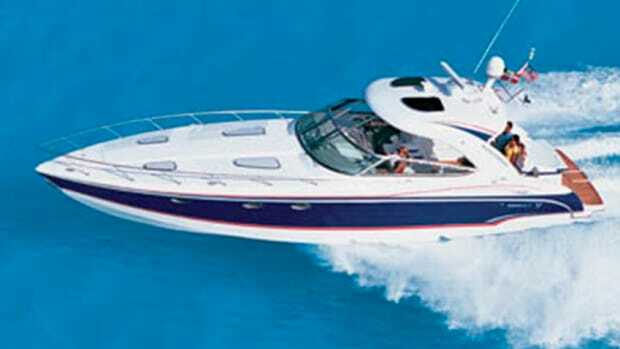 Well, that was my day on the water back in the fall of 2001 when I ran the Formula 370 Super Sport. However, in spite of the weather, the boat handled effortlessly in the sloppy three- and four-footers. 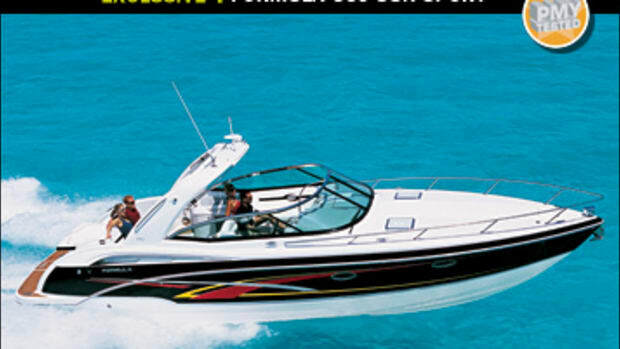 I recently had an equally pleasing boating experience—without the rain—in a Formula very different from that 370. 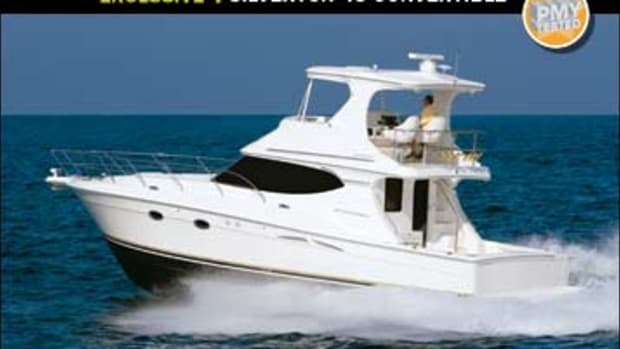 This one possessed the performance that Formula is noted for, but in 45 feet of yacht comfort and luxury. It all started when Formula rep Vic Spellberg eased the 45 Yacht from the fuel dock next to North Miami&apos;s Spinnaker Marina. 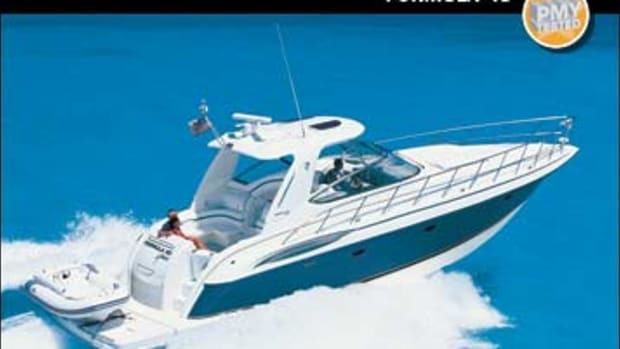 I could barely make out a sound emanating from the optional 575-hp Volvo Penta D9 diesel V-drives. The bridge-deck&apos;s distance from the powerplants, which rest just off centerline under the 45&apos;s fiberglass cockpit sole, helps immensely. Of course, a standard Eco Sound EPS 1000 underwater exhaust, a zipped-up aft drop curtain, and not having long shafts (which are susceptible to vibration) contributed, too. We didn&apos;t have to worry about the South Florida heat with everything closed up, either; this bridge deck, Formula&apos;s first with a standard and sleek-looking composite coupe hardtop, was equipped with 30,000 Btus of optional Marine Air air conditioning (another 19,000 Btus keeps below decks frosty). If you want fresh air or some sun, just open the electronically retractable sunroof (standard) and that aft curtain. In addition to being quiet, the powerplants are easily accessible via an electronically lifted cockpit hatch. The switch for it is cleverly located beneath the comfy and weather-resistant cockpit U-shape seating. Lift the aft port corner cushion, and press the switch that says "engine hatch." Once I&apos;d done so, I stepped into the compartment. There was just 15 inches between the engines, and while the engine room is not cavernous, at least regular maintenance chores like oil-level checks can be performed inboard, with the dipsticks right at your fingertips. I even managed to get my 5&apos;7", 170-pound frame outboard with moderate effort. Filters are on the forward bulkhead and within arm&apos;s reach. A centerline cockpit day hatch allows you to duck your head into the compartment for a quick look at the Racors. The Racors seemed fine to me, and so it was off to the bay to get some numbers. Spellberg manned the standard Dino mahogany wheel while I broke out the radar gun to see if this boat ran as hot as the bridge deck felt cool. The 45&apos;s time to plane was nine seconds on flat water, and while not a rocket ship off the line like the 370, she managed to hit an average top speed of 37.5 mph at 2500 rpm in less than 40 seconds. That&apos;s sporty performance and a relatively economical 58-gph fuel burn when you consider that this is a 30,000-pound-plus yacht. In addition, the coupe top was rock solid at WOT—no shaking or wavering, a result made more impressive by the fact it&apos;s fitted with a centerline walk-though windshield. The windshield dogged down tight and didn&apos;t let a whistle of wind through at speed, yet easily opened to access the two foredeck sunpads. Spellberg says a lot of research went into constructing the windshield, which is a signature element that&apos;s found on all Formulas. The 45 made a comfortable cruise of 33.6 mph at 2250 rpm, while the D9s consumed 43 gph. 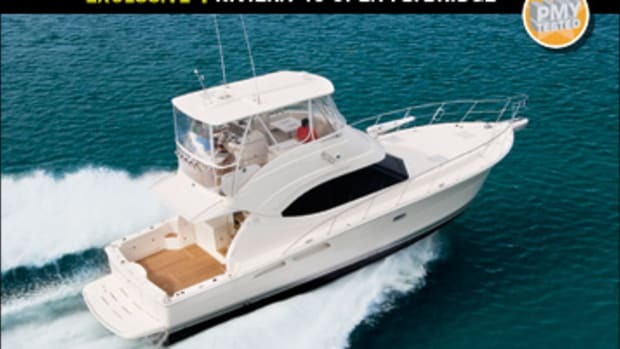 Taking into consideration her 350-gallon fuel capacity and accounting for a ten-percent reserve, my test boat can cruise at this speed for 246 statute miles, which equates to 0.78 mpg. And as per my test-day data, this speed offers the optimum blend of performance and economy for the 45. When we made a midday stop at Miami Beach Marina for a bite at Monty&apos;s, I noticed how easily the 45 spun in her own length and backed into her finger slip. A pair of large 26x35 four-blade nibral wheels and a ZF transmission with a torquey 2:1 gear reduction makes this maneuver possible. One nicely grilled dolphin sandwich later, and it was back out for an afternoon run. Spellberg turned over helm duties to me. The wind had picked up to a solid 15 knots, and there was a short-spaced, two-foot froth on the water that looked like frosting on the bay. I eased the Volvo Penta single-lever electronic controls up to WOT. As the engines spooled up through their midrange—between 1500 and 1750 rpm—I found that even while I was standing at the bolstered helm seat, the 45&apos;s bow rise partially blocked my forward sightlines (remember, I&apos;m 5&apos;7"). Her trim angle at this rpm was six degrees. She dropped to about five degrees at cruise speed, and from cruise down to forward idle, visibility forward was clear. The 45&apos;s solid-fiberglass, modified-V hull bottom (18-degree aft deadrise) easily ate up the chop and provided agile handling. In fact, she made turns that were so tight they reminded of spinning my skateboard on its heel when I was a kid. 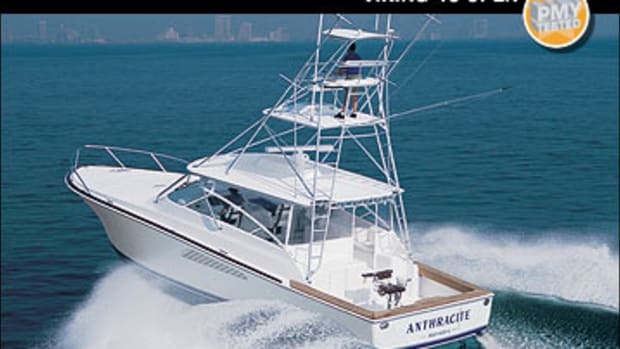 This boat&apos;s V-drive configuration plays a part in this, as does her Teleflex SeaStar power-assisted steering, but it&apos;s the 45&apos;s massive rudders, which measure 12 inches front to back and are 26 inches tall, that are mainly responsible for the enhanced wheel response. One drawback to her tight turn radius is that at high speed she has a strong inboard lean, which causes a momentary loss of visibility to the inside of the turn. 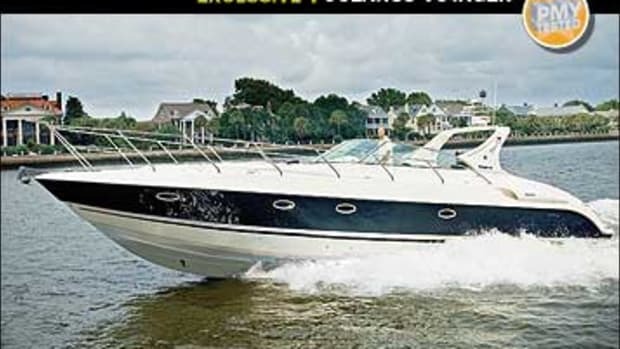 After working the 45 back through myriad no-wake zones, I passed the wheel back over to Spellberg, then had an opportunity to take note of the 45&apos;s luxury, such as the now-flipped-down, optional double-wide Ultraleather helm seat, Kenwood stereo, wet bar, and optional Gaggenau grill. 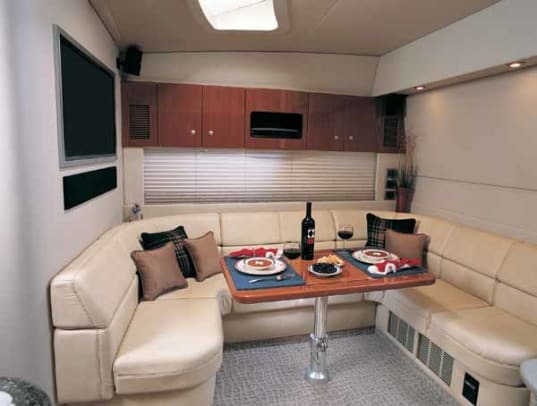 The on-the-water party set will enjoy this bridge-deck and cockpit layout, which is rivaled only by the below-deck&apos;s cleanly finished, high-gloss cherry interior and two-stateroom layout. Seven-foot headroom and large overhead hatches in the saloon make this space a wide-open and bright entertainment venue. Real teak and holly in the galley sole enhances the already-warm cherry, and on our test boat everything was accented by an optional Ralph Lauren decor package in—what else?—navy blue. With all this luxury and performance laid out in front of me, I just wanted to turn the boat around and head for Bimini, but I had a plane to catch. 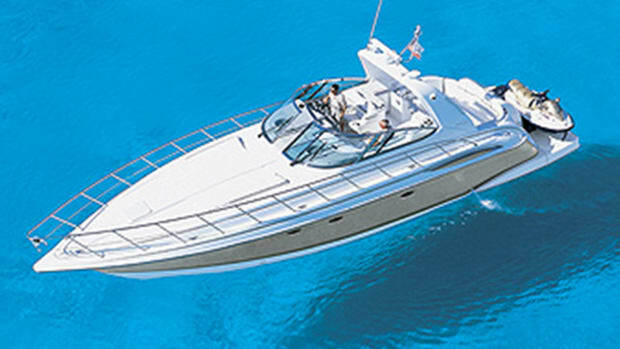 I&apos;ve been fortunate to drive a lot of boats, and where most vessels excel in one or two areas, the 45 excels in many: quality fiberglass construction (the fiberglass was finished in places I don&apos;t see every day), exceptional handling, clean, high-quality, grain-matched woodwork throughout, and a strong list of standards. 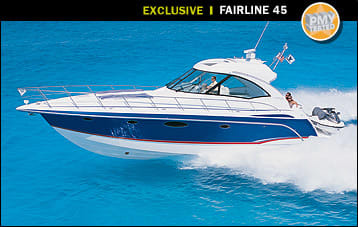 Formula has taken its high-performance boatbuilding skill and married it to a true luxury yacht. She&apos;s definitely worth taking for a test cruise down to Monty&apos;s for a bite, but be warned: You may wind up buying more than lunch by the time you get back.